Since the opening of the first Buddhist Practice Center in Amsterdam in June 2018, Guan Yin Citta Netherlands has organized a number of activities, such as Buddhist group study session and free vegetarian tasting events to spread the Buddhist teachings of Master Jun Hong Lu and traditional Chinese culture. On October 14, 2018, Guan Yin Citta Netherlands launched a brand new Buddhist Children’s Class for free. It attracted dozens of kids and their parents, and received positive responses. The aim of the program is to teach children Buddhist morals and ethics, help them cultivate a gracious attitude, spirit and heart with the mind of tolerance, appreciation, and compassion. By learning the basic concepts of Buddhism, children can develop a right world outlook on life and values, which will benefit them in a long term. The class also leads the children to overcome and correct inappropriate thoughts and bad habits, helping them fit and flourish in society. The first Children Buddhist Class contained four sections, including introduction of Guan Yin Bodhisattva and other five Bodhisattvas, Buddhist story sharing, Buddhist scriptures Reading, and table manners teaching. At the start of the class, volunteer teachers showed the children how to make prostration and show respect to Buddha. After learning the names of Bodhisattvas worshipped at Guan Yin Citta, every kid kneeled down in front of the figures of Bodhisattvas and made prostrations. After that, the class processed into the Buddhist story sharing section. One of the volunteer teachers told the children a story from Master Jun Hong Lu’s books. It’s about how a jewel business man, who has been sincerely reciting The Great Compassion Mantra every day, was saved by two Bodhisattvas in a dangerous situation. The riveting story made the children realize the importance of reciting Buddhist scriptures on a daily basis and the amazing effects. Once hardships come or bad things happen, people who have been performing diligent reciting practice can receive protections from Buddha and Bodhisattva. And then in the Buddhist Scripture Reading section, children were taught to read the “Great Compassion Mantra“, “Heart Sutra“, and “The Cundi Dharani” (Zhun Ti Shen Zhou). The children were full of confidence and chanting very well. Their positive attitude and earnest interest towards the learning moved some of the parents to tears. Some of the children were even able to recite the “Zhun Ti Shen Zhou” during the class, which was so amazing and incredible. Another highlight of the class is the teaching of table manners. 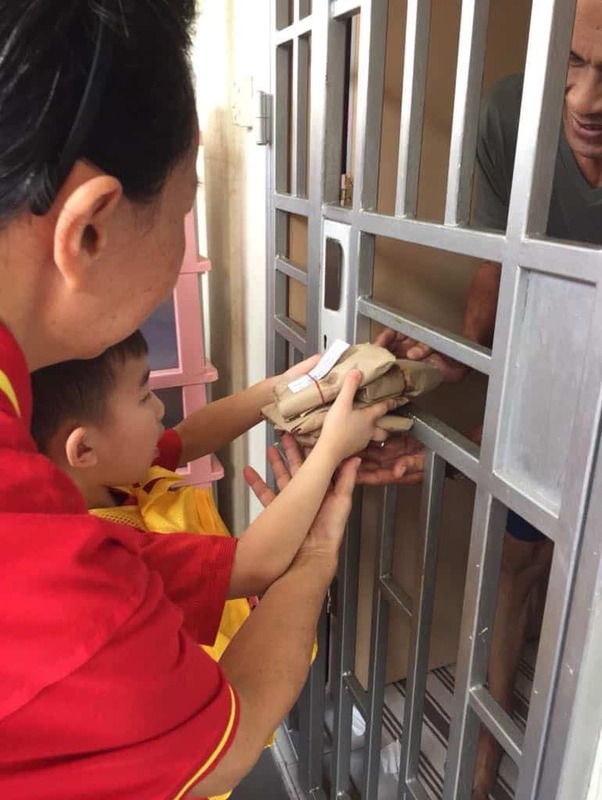 In this section, volunteer teachers taught the children the proper dinning etiquette, and Buddhist prayer before a meal to express gratitude to Guan Yin Bodhisattva. The teacher said, “When you have a meal, it is important to avoid some things. First, don’t insert your chopsticks upright in the bowl of rice, because it’s a way to offer to the spirit of a dead person. Second, don’t beat your bowl with spoons, chopsticks, because it can be associated with the behaviors of begging in the old times. Most importantly, do not point at other people with your chopsticks at the table, which is considered to be rude.” Under the guidance of teachers, the children were immersed in the traditional Chinese culture and happily enjoyed their meals in the right way. After the class, three kids expressed their interest in reading Buddhist scriptures and took some Buddhist books home. Everyone was excited and grateful for having such a good opportunity to learn so much. They are looking forward to the next gathering in the near future. On Monday, September 24, 2018, a grand opening ceremony of the third Guan Yin Citta Buddhist Practice Center in Spain took place at the port city of Valencia. The official opening of the Buddhist practice center marks a major milestone for the Guan Yin Citta Door and its development in Valencia over the past a few years. Celebrations continued on for a whole day, including a Grand Blessing Ceremony in the morning and a free vegetarian banquet in the evening. Many Buddhist friends traveled from across Spain as well as France, Germany, Denmark, Belgium, Italy, Hungary, Sweden, Finland, Ireland, Portugal, Austria, the Netherlands, and even the United States attended the celebration, which is considered exceptionally auspicious. The memorable day is filled with blessings and joy! For most of the last decade, the economic recession in Spain has caused many people to lose their jobs, homes and savings. Relying on the qualities of perseverance, diligence and courage, many overseas Chinese immigrants in Spain endured the hardship and withstood the economic adversity. As Guan Yin Citta Dharma spreads into the area of Valencia, more and more people are benefited from Master Jun Hong Lu’s Buddhist teachings, not only having life issues solved, but also gaining deeper spiritual support and comfort. The wisdom of Buddhism effectively helps them rebuild their faith and alleviate from suffering. Some of the Buddhist friends even have started to recognize the inherent pitfalls of the impure mind, and begin to utilize every moment of their life in positive ways to clean karmic debts and achieve a degree of inner peace. The grand blessing ceremony started at 10am and ended at 12pm. More than 700 Buddhist friends participated in the chanting of Buddhist scriptures and witnessed the magnificent moment. One of the Buddhist friend remarked, “The Buddhist practice center is stunning. I am so glad to be here. Spending a quiet moment in front of the statue of Guan Yin Bodhisattva made me experience an internal moment of peace and joy. I can’t help burst into tears with a warm feeling I never experienced before, greatest gratitude to Master Jun Hong Lu for bringing us such an amazing Dharma Door at the Dharma Ending Age.” To add to the hospitality of the day, volunteers from Guan Yin Citta Valencia prepared delicious vegetarian lunch for all the people attending the ceremony. In the evening at 7:30pm, a grand vegetarian banquet was held at a local restaurant with attendance of over 800 people. The leader of Guan Yin Citta Valencia first delivered a welcome speech to thank all the guests and Buddhist friends for all their support of the Guan Yin Citta and making the organization shine in Valencia. Then all the attendees watched clips of Master Jun Hong Lu’s worldwide Dharma propagations and Totem Readings. Two of the Buddhist practitioners shared their heartfelt experiences of overcoming life difficulties by practicing Guan Yin Citta Dharma Door. One of Buddhist friends successfully defeated breast cancer and the other one cured her daughter’s constipation. Coincidently, the Mid-Autumn Festival fell on the same day as the opening of Guan Yin Citta Valencia. Having so many Buddhist friends together in such a beautiful and joyous time is the best blessing and brings completeness and happiness. Wish the Guan Yin Citta Buddhist Practice Center in Valencia a brighter future and deliver more sentient beings! To commemorate the Guan Yin Bodhisattva’s Enlightenment Day, a Grand Blessing Ceremony was recently held at Fuyan Huguo Zen Monastery in Yilan, Taiwan. On this blessed day, the official opening of a new Guan Yin Citta Dharma Door Buddhist Practice Centre was also held. Guan Yin Citta Dharma Door has been in Taiwan for many years. Under the leadership and guidance of Master Jun Hong Lu, the Guan Yin Citta Dharma Door has propagated quickly over the past few years. Since 2013, Master Jun Hong Lu has given two large-scale Dharma Talks in Kaohsiung and Taipei, with 5,000 to 10,000 people in attendance. A number of major cities including Taipei, Taichung, Tainan, Taitung, Kaohsiung, Taoyuan, Keelung, and Chiayi have established Guan Yin Citta Practice Centres, serving as the spiritual homes for many Buddhist practitioners and friends. This new centre in Yilan marks a major milestone for the development of Guan Yin Citta Dharma Door in Taiwan. On this day, more than 500 Buddhist abbots, monks, practitioners, and friends from Taiwan and all over the globe attended this magnificent ceremony. The Grand Blessing Ceremony started at 10am and was conducted in the open space area of the Ruyi Hall. This ceremony was hosted by Venerable Shi Hong Rong, the abbot of Fuyan Huguo Zen Monastery in Yilan, and Venerable Shi Wei Fang, the abbot of Ru Yi Temple in the United States. The ceremony involved chanting of Buddhist scriptures followed by a series of rituals. Statues of Shakyamuni Buddha, Guan Yin Bodhisattva, Nanjing Bodhisattva, Tai Sui Bodhisattva, Guan Di Bodhisattva, Zhou Tsang Bodhisattva, and Guan Ping Bodhisattva were blessed and then worshipped by the attendees who were present at the ceremony. An atmosphere of solemnity and reverence pervaded the area during the entire blessing session. After the blessings, the two abbots and Venerable Shi Xin Jing, the abbot of Guan Yin Hall of Wisemans Ferry, Australia, delivered their speeches respectively. They commended the establishment of this new Buddhist practice centre in Yilan, Taiwan, as being an auspicious outcome for not only the local people, but also all Buddhists worldwide. Thanks to the blessings from Bodhisattvas, the full support of Master Jun Hong Lu, and the hard work of many dedicated people, the entire ceremony progressed smoothly. The Fuyan Huguo Zen Monastery was built way back in the 1961. Each year, a seemingly endless stream of pilgrims comes to worship at the monastery for the past 50 years. Now, with the establishment of the new Guan Yin Citta Buddhist Practice Centre, visitors can experience even more spiritual benefits when visiting the place. In the afternoon, the guests were treated with the screening of touching videos showing Buddhist Master Jun Hong Lu’s Dharma propagation activities around the world. This was followed by Master Jun Hong Lu’s introductory Dharma messages for the people of Taiwan. Since 2015, Guan Yin Citta Practice Centres in Taipei, Kaohsiung, and Taichung have organised four large-scale Buddhist charity events, with tens of thousands of attendees having come to experience their vegetarian delicacies. Dozens of small-scale events have also been held in Taipei, Taichung, Kaohsiung, Chiayi, Tainan, and Yilan. The objectives of organising these events are to promote the core values of Buddhism, traditional Chinese culture, and to advocate for a compassionate vegetarian diet that brings immense benefits to our health and environment. These activities have always received great recognition as well as positive feedback from the local communities. Hopefully, with the new establishment of the practice centre in Yilan, Guan Yin Citta Dharma Door will continue to flourish across Taiwan, and make more positive impacts on the society. In this way, more people can start to practise the Buddhism way of life and to begin applying the wisdom of Dharma into their daily lives to improve and change their destinies.